The success of future neurodegenerative disease (ND) therapies depends partly on accurate antemortem diagnoses. Relatively few prior studies have been performed on large, multicenter-derived datasets to test the accuracy of final clinical ND diagnoses in relation to definitive neuropathological findings. Data were analyzed from the University of Kentucky Alzheimer’s Disease Center autopsy series and from the National Alzheimer’s Coordinating Center (NACC) registry. NACC data are derived from 31 different academic medical centers, each with strong clinical expertise and infrastructure pertaining to NDs. The final clinical diagnoses were compared systematically with subsequent neuropathology diagnoses. Among subjects meeting final inclusion criteria (N = 2,861 for NACC Registry data), the strength of the associations between clinical diagnoses and subsequent ND diagnoses was only moderate. This was particularly true in the case of dementia with Lewy bodies (DLB): the sensitivity of clinical diagnoses was quite low (32.1% for pure DLB and 12.1% for Alzheimer’s disease (AD + DLB) although specificity was over 95%. AD clinical diagnoses were more accurate (85.0% sensitivity and 51.1% specificity). The accuracy of clinical DLB diagnoses became somewhat lower over the past decade, due apparently to increased “over-calling” the diagnosis in patients with severe cognitive impairment. 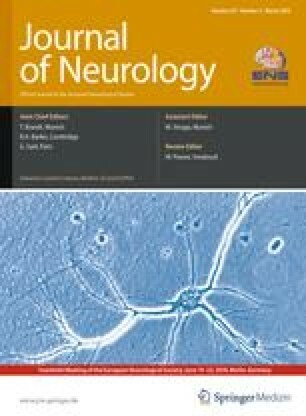 Furthermore, using visual hallucinations, extrapyramidal signs, and/or fluctuating cognition as part of the clinical criteria for DLB diagnosis was of minimal utility in a group (N = 237) with high prevalence of severe dementia. Our data suggest that further work is needed to refine our ability to identify specific aging-related brain disease mechanisms, especially in DLB. The online version of this article (doi: 10.1007/s00415-009-5324-y) contains supplementary material, which is available to authorized users. This study was supported by grants R01 NS061933, K08 NS050110, P30-AG028383, and U01 AG016976 from the NIH, Bethesda, MD. We are deeply grateful to all of the study participants. We thank Ela Patel, Ann Tudor, Paula Thomason, Dr. Huaichen Liu and Sonya Anderson for the technical support, Nancy Stiles, MD and Allison Caban-Holt, PhD for the clinical evaluations, and Daron Davis MD for pathological evaluations. We also thank Leslie E. Phillips, MS for help with NACC data.